Today I'm glad to announce this blog first sponsor. After a year and more of posting here it comes. If you'll buy something from them they'll give me a little commission. In this way you can give me a little thank you for all these beautiful posts, that I've gathered here over time. This clock will run all over the house, and make noise just to make sure you'll wake up.You can see it in action here. Making your faucet different. 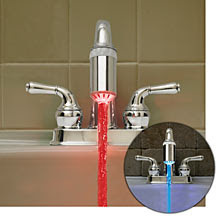 Just attach to the end of your faucet (universal adapters included), and when the water flows through the magic chamber, it simply turns on the LED array and illuminates the stream with soothingly powerful hues. 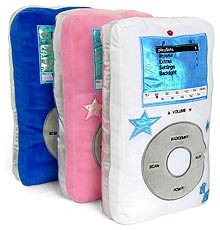 Ipod Pillow for all Ipod lovers, and the best part is that these plushy pillows can actually play music. Animated Retro Table Tennis Shirt, if you would like some action on your clothes. These are just some products from our sponsor that I liked. They have a lot of cool stuff, check their website for more.